Welcome! This document describes an energy efficient, solar-powered home that my husband, Randy Cullom, and I (Who am I? 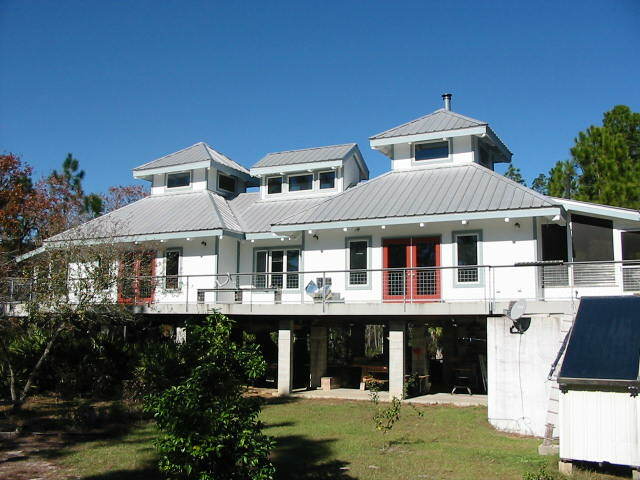 )have built near Interlachen, Florida. We lived in the house from mid-1998 until mid-2006, and will describe here some of our successes and failures and some of the many things we have learned along the way. Our original plan was to use no fossil fuels at all. We relaxed that ideal a bit, and have some propane appliances as convenience and backup systems. Our total use of propane was about 30-35 gallons per year, for which we paid about $100, including delivery. We also have a backup Honda gas generator, which we rarely use. The house is not connected to the utility grid. We have a Clivus Multrum composting toilet and are not connected to a public sewer or septic tank. Although we used well water, we have built a 3000 gallon cistern which can be used to collect rainwater for all household water needs. Why did we do this? Primarily, we hoped to demonstrate that humans can live in a comfortable and pleasing home while attempting to minimize their negative impact on the earth. The design and building of the home was an exciting challenge that was in progress for over 10 years. We have now sold the house to a family that intends to keep the vision going! 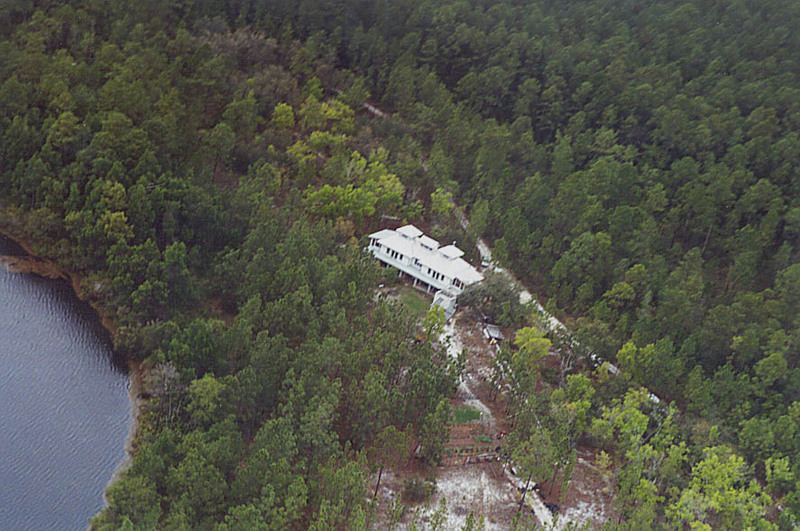 This is an aerial view of our house in its setting of Florida forest on Boll Green Lake. This picture was taken by Sally Leach from an airplane piloted by her husband Greg. They had flown up from south Florida to visit in April 2001. The house is near the middle of 60 acres of wooded land 50 miles south, southwest of Jacksonville. North Florida is fairly flat, but ecosystems can change dramatically with elevation changes of a few feet. 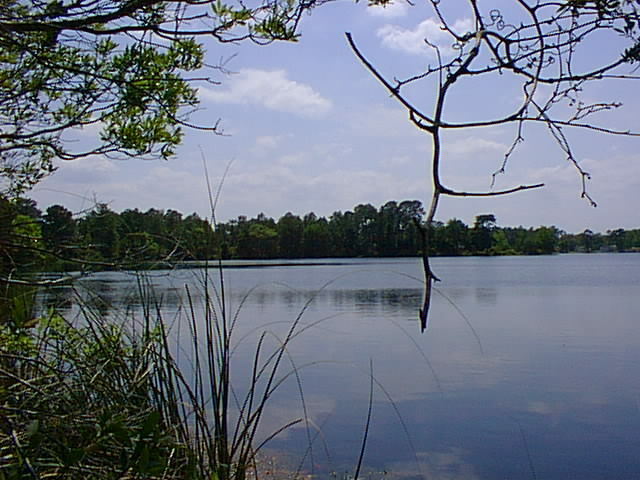 This picture shows a view of the lake from our property. We share a 1/2 mile border with two small lakes, and at one part of the interface is a pitcher plant bog/wetlands community. On the north border of the property is a low bayhead area. Approximately 15 acres comprises a longleaf pine/wiregrass/turkey oak ecosystem. Please click here to see some more pictures. Our goal is to make the land as accessible as possible to wildlife. The land belongs to them. Some of the wildlife that we have observed include black bear (tracks only), bald eagles, osprey, swallowed-tailed kites, anhinga, green herons (nesting), great blue herons, pileated, red-bellied and red- headed woodpeckers, red-shouldered hawks, wild turkeys, a pair of screech owls and eastern bluebirds nesting in our birdboxes, flying squirrels, Sherman's fox squirrels, grey squirrels, grey fox, gopher tortoise, box turtles, water turtles, alligators, otter, deer, numerous snakes, lizards, frogs, and, of course, insects. The house was designed by Liz in 3 dimensions using AutoCAD-12. The CAD drawing above shows an isometric view looking north/northeast. The complete metal roof is shown on the right-hand side, while the roof deck underneath is revealed at the left. 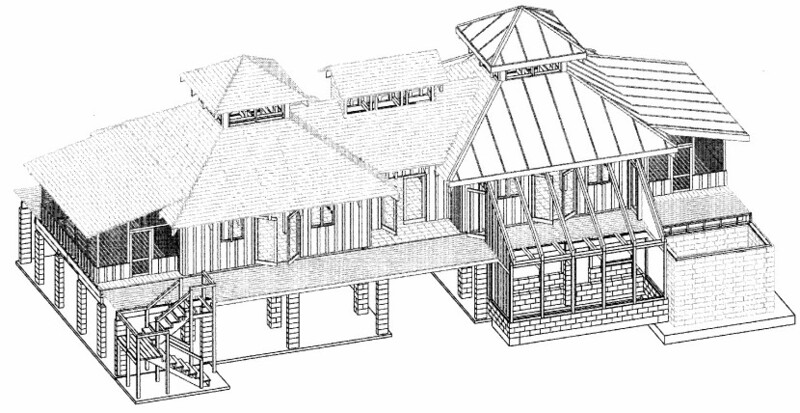 The house design is based on the "Cracker" architectural style typical of early settlers in Florida, and incorporates many energy conserving features that are tailored to the hot, humid climate found in the southeastern United States. These include cupolas, large roof overhangs, porches on the east and west sides, ventilation under the house, a kitchen and bathroom isolated from the living room and bedroom and many others described in detail in the chapter on House Design. This figure shows where we were in December of 2003. It is a view looking north/northwest at about noon. Note that the sun illuminates almost all of the window and door glazing in the winter. In summer, the entire south side of the house is shaded. Part of the cistern can be seen at the lower right. Now, in January of 2004, we are working on interior trim and kitchen cabinets. We have not yet finished the breezeway and bedroom floors or the roof gutters to enable rainwater collection. To view some pictures of us working on the subfloor, click here. Electric power is provided entirely by photovoltaics. We have 1.2 kilowatts of Siemens PV modules on three Zomeworks trackers. The power system and sizing is described in detail in the chapter on Electric Power. The prominent concrete block structure on the southeast side of the house in the AutoCAD drawing is a cistern. 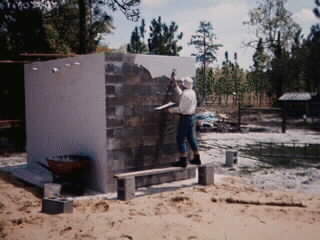 The next figure shows Randy putting a waterproof plaster coating on our cistern. The capacity of the cistern is slightly over 3000 gallons. Rainwater that falls on the metal roof will run through gutters and downspouts and will be collected in the cistern. This rainwater will be filtered and purified and pumped throughout the house and will be the only source of water for all household, drinking and cooking purposes. A separate cistern (not shown) will be used for the garden and irrigation. The cisterns and water supply system is described in the chapter on Water Supply. How can you do away with a sewer system or septic tank? It's easy with a composting toilet! A composting toilet converts all toilet wastes into harmless (even beneficial) compost, thus eliminating the "blackwater" that requires sewage treatment. All other household water waste can be considered "graywater", and can be safely be piped to a simple drainfield in the yard. More on this system in the chapter on Wastewater System. The two most difficult challenges in designing an energy efficient home with minimal dependence on fossil fuels have been air conditioning and cooking. In the hot, humid Southeast, air conditioning is needed more for dehumidification than for cooling. Without some form of dehumidification, mold and mildew can become a serious problem. Our house has been designed to minimize mold and mildew problems through use of ventilation, but we are experimenting with a commercial (Friedrich) 10,200 BTU room air conditioner, which requires about 870 Watts to run. Our experience with this air conditioner, as well as as our space heating and ventilation system is described in the chapter on Heating, Ventilation and Air Conditioning. As explained above, another major challenge has been providing for cooking with minimal reliance on fossil fuels. The solution for us will lie in utilizing a variety of cookers. A solar oven is excellent for dishes that require steaming or simmering, much like a crock pot. It reaches 350 degrees F routinely, and can be used for baking. A well insulated wood cookstove is an obvious choice for cooler months, but can also be used in the summer if needed. We have installed a Premier propane kitchen stove for convenience and as a backup system. It requires electricity only to light the stove with an electronic spark, otherwise, it can be lit with a match. We almost never use the oven, but the range is used for quick heating or cooking jobs. Also, because the refrigerator is a major power user in most households, the choice of model is an important one. These solutions for cooking and food storage, and others will be discussed in the chapter on Food. Finally, we have tried to choose building materials that are renewable, locally produced and natural as much as possible. We have made an effort to choose materials that are safe and non-toxic to produce and use. This is an area that is rapidly expanding and new products are introduced each day, however finding green building materials is still a challenge, and requires much more research than a trip to the local hardware store. Find out how we have solved some of these challenges in our chapter on Green Building.